The safe and efficient movement of goods is a critical component of any economy, including that of the Tampa Bay region. The transport of goods via the road and rail network throughout Pinellas County supports commercial and industrial growth and job creation regionally as well as locally. Forward Pinellas maintains a Truck Route Map to identify those roadways where heavy trucks must travel and highlight those routes where time restrictions apply. Forward Pinellas works with each municipality and the County to identify roadways appropriate for through-truck movements and to develop ordinances regulating truck traffic, in an effort to maintain consistency across jurisdictional boundaries. In Pinellas County, trucks are required to use designated truck routes up to the point closest to their destination. Recognizing that goods movement is a critical component of the regional and state economy, FDOT District 7 and its partners on the Regional Goods Movement Advisory Committee, including Forward Pinellas, have worked to prepare the Tampa Bay Regional Strategic Freight Plan in response to a steadily-increasing emphasis on freight mobility concerns and economic development in recent years. The Plan study area covers a an 8 county region that includes more than 50 municipalities. As a part of this study, FDOT conducted a region-wide analysis of freight bottlenecks and operational hot spots, identified local freight industry representatives and confirmed by FDOT. The Comprehensive Freight Improvement Database catalogs each of these locations and identifies solutions for each problem spot. 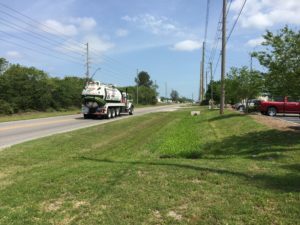 FDOT has prioritized funding to help implement some of the improvements. Others will be corrected during routine resurfacing or reconstruction projects. In 2008, Forward Pinellas, as the Pinellas County MPO, completed the development of a Goods Movement Study. The objective of the study was to develop a safe and cost effective Goods Movement Routing Plan that represents the community consensus of a balanced approach between economic development and the environmental and livability concerns of affected communities. The process to design that approach addressed traffic engineering, community values and economic concerns. Interest groups representing those concerns were asked to participate in designing the criteria to designate truck routes in Pinellas County.